This pretty little church sits in its neat, tree-lined churchyard near the centre of this village. The Anglican parish church is out in the fields to the north, and so this building acts as a focal point in the middle of Corton, which is the strangest of villages, the largest part of it taken up by a vast holiday camp. The main materials are a pleasing mixture of flint and red brick, with an elegant triple lancet above the eastern entrance. 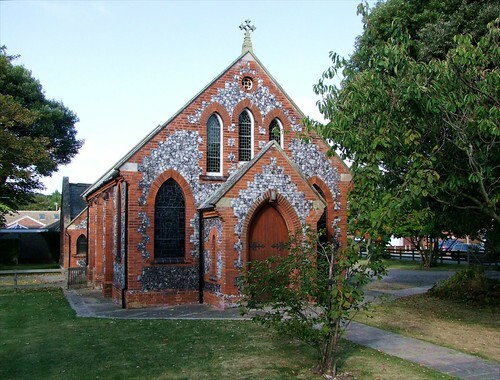 As with many Methodist churches in east Norfolk and north Suffolk, the building here was bankrolled by the Colman family of Norwich (rather charmingly, the monthly social meeting is called the Mustard Seed). The church website says that the building is popular for weddings. Where I live in south Suffolk, Methodism increasingly feels like an enthusiasm which has had its day. It is always a pleasure to come up here and find that Methodist churches are still relatively thick on the ground, although it must be said that this one did not appear to be taking part in the annual Suffolk Historic Churches bike ride, unlike its Methodist neighbours further into town.